TWO HUNTS FOR THE PRICE OF ONE! Saturday was an absolute result for hunted wildlife! Our first port of call was to an early morning cubbing meet of the ‘Ledbury South’ near Saint Margarets, Herefordshire. We got to work trying to find the hunt and their location was soon given away by their dickhead terrier-boys. Thanks, lads! As soon as the hunt were in our sights it was game over. Sabs got to work and immediately took control of the hounds, rendering the hunt useless. This first act of sabotage set the tone for the rest of the morning. We split into two groups which meant we were completely on top of the hunt. Every time they attempted to hunt foxes, we stepped in and took control of the hounds using horns, voice calls and our trusty gizmo (a pre-recorded track of hounds in ‘cry’ played through a megaphone). Both foxes and hares were aided to safety by sabs and it all became a bit comical towards the end of the morning as the hounds spent more time with us than the hunt. Absolutely blinding result, especially given the context – the ‘Ledbury South’ are essentially the former riders and masters of the dissolved South Herefordshire Hunt (who are currently at the centre of a police investigation after being caught on camera feeding live fox cubs to hounds at their kennels last year) following the hounds and huntsman of the equally distasteful Ledbury Hunt. 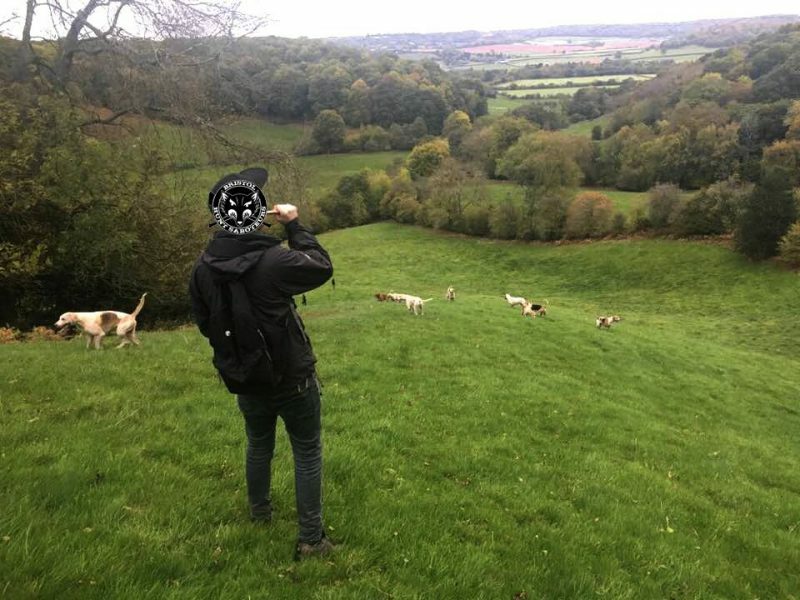 Next up we were off to our second hunt of the day, the Severn Vale Beagles, after a spotting car kennel-watched them and followed on to their meet in North Nibley, nr. Dursley, Gloucestershire. When sabs arrived shortly after 1pm, we found the hunt already out and setting up to ‘draw’ a field in an attempt to put up and chase hare. As soon as our cameras were on them they were on the phone and legging it – a sign of wrong doing if there ever was one! We kept eyes on them as they did a little circuit, mopping up their followers on the way back to the meet. As our second vehicle arrived, they were boxing up the beagles and quickly scarpered! A long and tiring day for us but a good ‘un.